#1 Holiday Ornaments Flyer $22.00 Offer prospects a discount on their NEXT service or change the offer and text completely. 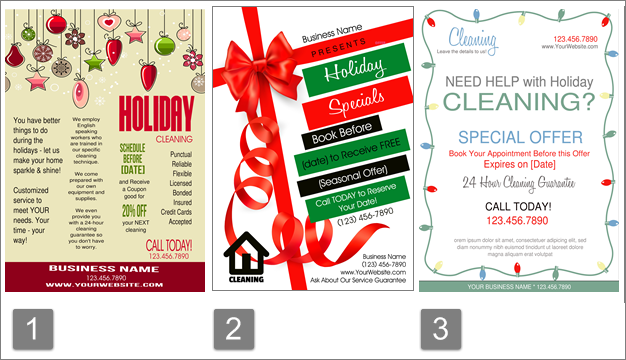 #2 Holiday Ribbon Flyer $22.00 Offer prospects a Holiday Special or change the offer and text completely. #3 Christmas Lights Flyer $22.00 Give prospects a Special Offer or change the offer and text completely. #4 Christmas Tree Flyer $22.00 Give prospects a discount on the holiday service or change the offer and text completely. #5 Christmas Ball Flyer $22.00 Give prospects a discount for ongoing service or change the offer and text completely. #6 Holiday Boxes Flyer $22.00 Give prospects a discount on two appointments or change the offer and text completely. Make Your Selection: Select 1 or more flyers by clicking on the box next to the flyer(s) you want to order. 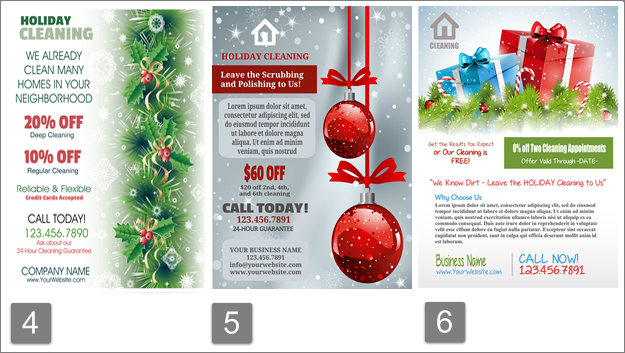 If you select more than 1 flyers, you will have a separate file to download for each flyer. Guarantee/Refund Policy: There are NO refunds on flyers. Customization is included with your order.